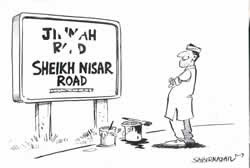 I wonder why the city government of Sahiwal renamed Fatima Jinnah Road as Shaikh Nisar Ahmed Road. Perhaps it was expected that it would start raining money in Sahiwal after this action! It’s not a bad idea, really, come to think of it. Our founding fathers had a clear idea of what Pakistan should be, and our subsequent leaders have left no stone unturned when it comes to ensuring that exactly the opposite should happen to the country. Why not remove the names “Jinnah” and “Iqbal” altogether from our lexicon? Jinnah Terminal, for instance, could be renamed Ch Shujaat Airport, while the international airport in Lahore could be called Ch Pervaiz Elahi airport.